Knightdale Parks and Recreation will be celebrating our second annual Mumkin Fest on Friday, September 28th and Saturday, September 29th at Knightdale Station Park. Friday, September 28th - 6pm-9pm: Bring your lawn chairs and enjoy an evening at the park with food trucks and great music. 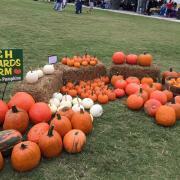 Saturday, September 29th - 10am-7pm: Mark your calendars and bring the family to Knightdale Station Park for a fun-filled day of bands, vendors, Mum and Pumpkins patch, food trucks, inflatables, hayrides and a beer garden. If you are interested in being a vendor please click here for a vendor registration form. This is a fun-filled family weekend to kick off the beginning of fall. For more information or to be a vendor please contact Susie Paschal at 919-217-2236.